I’m taking a little detour from local search marketing to discuss and recommend a solution for project management and CRM software. I’ve used project management software for many years now and recently developed my own system that made sense to me. But recently I’ve realized that there are major things missing and that I needed to look around for a robust system that allowed me to do what I do best (internet marketing) and let others build and maintain the software that I use to manage my business. The problem is that I have a long list of requirements. What I really need is one online system where I can manage my staff’s tasks and time tracking, view and understand their workload, easily manage my projects and tasks, my sales leads and collaborate and organize and store all of my company’s procedural documents. I know there is stuff out there that does all this but the devil is in the details. Let me be a little more specific. Project Management: Our company is all about projects and tasks. I needed a system where everyone could easily manage and organize their world and where I could see what people were doing. Task Management: Assigment and management of staff tasks as well as organization of my own tasks and responsibilities within the company. Overlap with production and sales would be a huge bonus. Having a way to setup task “templates” for projects and tasks would also be a bonus so we can quickly put projects into motion that have the same procedure each time. Time Tracking: Knowing how much time my staff has or has used to complete their tasks is vital to our business success. CRM: My partner and I need a way to manage our contacts, leads, sale opporutnities, reminders to follow-up, and ultimately manage the intimate details of our “sales world”. Procedures: Linking tasks and projects to specific step-by-step procedures for every step in our processes. There are many ways to do this online but having this integrated and managed within the same system online would be a big plus. Calendar: We need a simple calendar system to record tasks related to recurring client tasks. We currently use and share Google Calendar for our personal schedules which is good, but there is an issue with this for employees that manage specific clients tasks and reminders. What if they leave the company? All of their important reminders are contained within their Google account. We need a way to control this and make the transition easy if someone leaves the company. 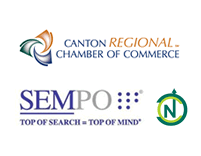 Internal communications: Sending and receiving emials can become messy as you know. Having a simple, centralized system to manage project and task communications, files and docs is essential to being organized and stress free. Price: There are many, many options but ultimately the price had to be right. I wanted to find a robust solution that didn’t require me to pay 5 figures a year. Many project management systems are priced based on things like how many projects you have in the system, or worse, how many users you have setup and using the system. Pricing structures like this could quickly get out of hand. Design: I was a graphic designer in another life. So deep down I have a need to work within a well designed system. If I’m going to use this system all day every day it better look great and function effortlessly. It’s like the house you live in. It’s gotta look great and make you WANT to be there or you’ll have resistance to being there as much as you should. Ease-of-use: It had to be easy to use and have a quick ramp-up time for employees. I didn’t want this system to be something that required days or weeks to get your head wrapped around. It needed to be simple, clean and intuitive. SaaS: It had to be hosted, maintained and continually improved by someone else. Mobile: Yes, I gotta use my iPhone. I reviewed about 75 different systems based on my wishlist. My top 3 requirements to weed out the junk were: robust project management, integration with CRM and price. If you want to do your own research you can Google “project management and crm software” for an endless stream of results and options or check out this site which was very, very helpful. Ultimately I have to say though, I didn’t find exactly what I was looking for. There was always something missing. If it wasn’t price, it was functionality or the damn thing looked so ugly and unorganized that I knew that I would just shoot myself in the head. I considered services like podio.com, apptivo.com, do.com, asana.com and others but nothing really fit the bill. Apollo is project management, task management, time tracking, CRM, Calendar, and Communications all wrapped up in a beautiful, easy to use online software package. The only major missing piece for me is a system for storing and managing documents for procedures. The funny thing about Apollo is that it looks like someone got pissed at the boys over at 37 Signals and decided to take their products and combine them all into one, make the package look better and sell it cheaper! I’ve used Basecamp and systems like Highrise and it really is amazing how similar it all is. But I’m ok with that. If you have a way to improve on someone else’s solution and ultimately provide a better service I think that’s great for everyone. It pushes companies to innovate and I think that’s great. Funny note: The URL is even similar to the 37 Signals products and they have an obvious and clear way to migrate everything from the 37 signals products! Apollo is attractively priced and even though they do charge based on the number of users, the number they give you for the money is acceptable. For under $50/mo. you get 40 projects, 15 gigs of storage, unlimited users, unlimited deals and 20,000 contacts. More than enough for a small business. For double that price you can jump up to over 100 projects and if you can’t pay $100/mo. to have a system to manage 100 projects then you’re doing something seriously wrong. So I’m going to recommend Apollo and slowly get intimate with the software. I’ve reviewed almost every feature and it all looks great. Maybe in the future they’ll decide to give us a way to oranize our procedural checklists and documents. But for now I think we will move forward and see how things go. 1) Document and information management. Apollo does allow you to manage documents and files but it’s managed at the project level. I need this to be managed and organized in a separate “library” of files that I can then easily link to from within projects and tasks. Ideally I need a way to organize client information (links, passwords, services) and attach it all to a “Client” in the system. 2) Better reporting and visibility of workloads: I can easily see the projects, tasks and even manage task priorities but I think this could be improved to give you a better reporting of overall workload and time available. I think it will work for me but I’d like to see at a glance if someone has 5 hours available or 50 to take on more work. 3) Improved pricing: I’m nitpicking here but come on. The cost to run this system has nothing to do with the number of users or projects in the system. Make it easy on people and just charge for the things that really cost money. If you need massive storage then up the price. Otherwise don’t screw around with subscription levels. Just give us unlimited everything and I can guarantee that users will flock to Apollo. Various sorting options for status, type, due date, etc. View tasks that have unread comments and read comments/thread without leaving the screen. BAD: No option to prioritize order at this point. Tasks should have a general due date. No recurring reminders for tasks. Would have to be added on calendar. 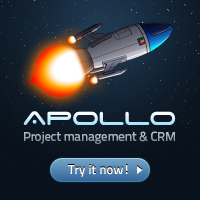 Click here to sign-up for Apollo and “launch” your new project management and CRM system!